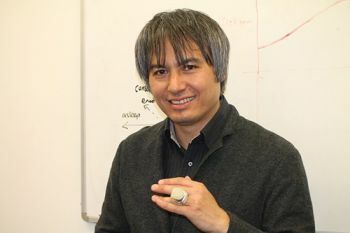 Professor of Pervasive Computing, Professor Adrian Cheok, will showcase his path-breaking work on the multi-sensory internet from 9th to 11th June at the Natural History Museum during Universities Week 2014. City University London will be staging a Circus for the Senses at the National History Museum during Universities Week 2014. The City stand will literally give visitors a feel and taste for the brave new world of Professor Adrian Cheok's multi-sensory internet. It will feature the Scentee device which connects to a smartphone and emits the smell of one's favourite meal. Also on display will be the first ever telehug ring and a digitally actuated lollipop to stimulate the taste buds. Professor Cheok, who is a Professor of Pervasive Computing in the School of Mathematics, Computer Science & Engineering, is the founder and director of the Mixed Reality Lab. He joined City last August from Keio University, Japan, where he was a professor in its Graduate School of Media Design. He has also previously been a senior academic at the National University of Singapore, and has worked in real-time systems, soft computing, and embedded computing at Mitsubishi Electric Research Labs, Japan. His research covers mixed reality, human-computer interfaces, wearable computers and ubiquitous computing, fuzzy systems, embedded systems and power electronics. Professor Cheok's work was recently featured on the BBC flagship technology programme, Click. During Universities Week 2014, City joins universities across the UK celebrating their most cutting-edge research. Entrance to the Natural History Museum and City's Circus for the Senses is free.